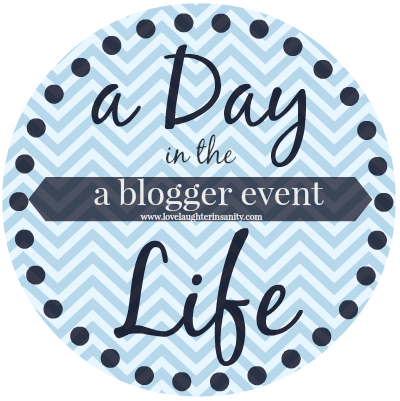 Tomorrow (March 31st) will be my 3rd year blogoversary! Each blogoversary is still kind of amazing to me - I’m so glad that I’ve kept up with this hobby for so long. It’s still a lot of fun to share my thoughts on books and other fandoms and interact with so many wonderful bloggers! This is the first time I’m properly posting about my blogoversary actually - it’s always kinda snuck up on me before in the past. Finding the name for my blog was VERY difficult. I think I went through a couple of names in the beginning - the very first one I can’t remember, but the second one lasted me some time - like a week. For a time I used the name “Le Livre Pond” which integrated two things that I have an interest in - the French language and Doctor Who. But after awhile, I didn’t really like it, and also it was hard for me to create a simple visual for it that I could use for my blog layout. 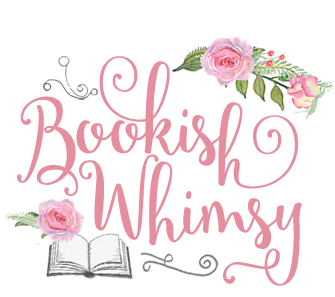 So I went back to the drawing board, by thinking of words that I really like and I like the word “whimsy.” And then I just added in the Bookish to make it a book blog related name. A nice American couple, Bobby and Liz are in a South American country and are eager to see the dictator who is driving by in a parade. They want to take a picture but are told they are not allowed. They try anyways, just when there is an assassination attempt on the dictator. The couple are then taken in by the treasonous military men who planned their dictator's death and are threatened to produce the photo. Except Bobby realizes he forgot to take the cap off his camera and never got a photo. This was an interesting story to listen to. One that shows a picture I think of what Americans thought the politics were like in dictatorships and of what motivates people who are so desperate for power and money. And the American couple is shown in a great light since the husband uses a clever ploy to try to get out of their bad situation. I thought this was a pretty entertaining episode overall, with an interesting and cynical resolution. Trish from Love, Laughter and a Touch of Insanity is hosting this one day event where bloggers post about their day, and when I saw the blog button on Angie's blog, I decided I wanted to participate! 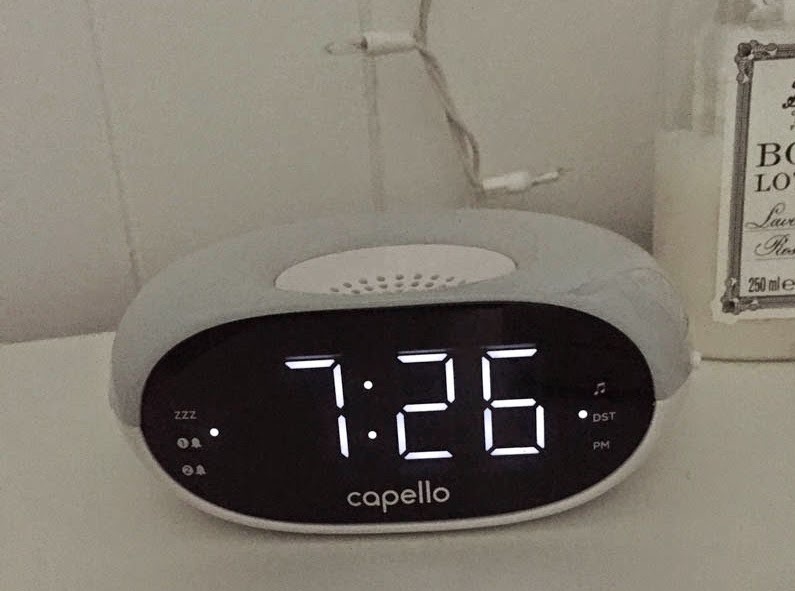 Trish mentions in her post that it's nice to record a day just to look back on it a few years down the line and see what you did and how your day was, so that is mostly why I was interested in doing this post. I'm going to detail what was my Wednesday though - March 25th - instead of updating this post with the happenings of today. In Movie Musical Challenge, I'm watching all 25 picks for AFI's Greatest musicals starting from the bottom. 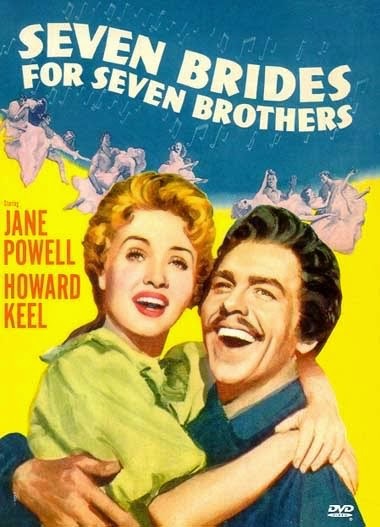 Number 21 is the 1954 film Seven Brides for Seven Brothers starring Jane Powell and Howard Keel. And lots of very good looking brothers! Um, this musical is utterly charming. I love that it has a western setting (its set in 1850s Oregon), the music is very catchy, and the dancing! There's a particular sequence at a barn party where the brothers are trying to get the attention of the ladies (by the way there's not enough women to go around) so they keep trying to steal them away from the town suitors. The dancing is wonderfully boisterous and athletic (although so not what you would see at the time!) and that whole sequence kind of gave me chills, it was so well done and so exuberant! The film does have some questionable aspects to the narrative - some sexism and a really weird-for-me kidnapping scene, which plays out sort of like a romp for the brothers, but it is absolutely not okay. Thankfully Jane Powell's character puts the brothers in their place and makes everything right. But it is very strange. It's important though that in the beginning we get a strong sense of the brothers being good guys! Obsessed with magic and illusions since childhood, Derren's life to date has been an extraordinary journey and here, in Confessions of a Conjuror, he allows us all to join him on a magical mystery tour - to the centre of his brain... Taking as his starting point the various stages of a conjuring trick he's performing in a crowded restaurant, Derren's endlessly engaging narrative wanders through subjects from all points of the compass, from the history of magic and the fundamentals of psychology to the joys of internet shopping and the proper use of Parmesan cheese. Brilliant, hilarious and entirely unlike anything else you have ever read before, Confessions of a Conjuror is a complete and utter joy. 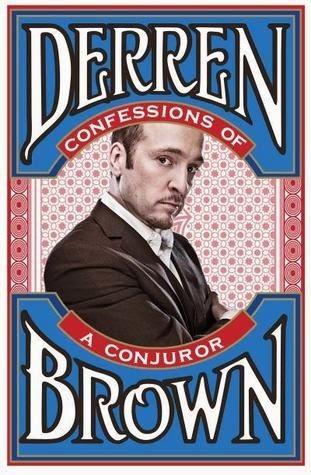 Derren Brown is one of my favorite people, so of course I highly enjoyed this book - it is actually one of my favorites. What's so great about this book is the way it's constructed because it is not a conventional kind of autobiography. Derren Brown performs magnificent mental tricks and illusions, so he's very aware of himself and very self-analytical in the way he tells his story. I found that aspect to be very relatable, and I think others who identify with being socially awkward, introspective and curious can also relate to his story. The way he illuminates his own psyche with examples, and the thought processes of why some people can act a certain way, gives the reader the tools to try and understand their own quirks. This book is a strange balance of personal stories, psychology, history, humor, and minutia. Derren's way of interweaving his philosophical thoughts with, let's say, his nervous tics, his petty shoplifting as a child, his method of cooking the perfect eggs benedict, his list of perfect books to read while on the toilet and his interest in art and music is fascinating to me and especially enjoyable because he expresses himself with such humor and self-deprecation. To further separate this story from traditional memoirs, Derren frames the whole of his narrative by describing a performance of one of his card tricks to a group of strangers. In the way he describes what's going on in his mind at each step as he performs it, he digresses into many different threads of thought which gives the background of his experiences growing up, his interest in magic, and the way his mind thinks. After reading this book, I get such a sense of understanding - not just of what kind of person Derren Brown is, but also of his joy of life which is what I usually feel whenever I see one of Derren's more inspiring television performances. That and a sense of awe. I think this is a book that all fans of Derren Brown will enjoy, but there is an added level of thought-provoking self-analysis that could appeal to any reader unfamiliar with Derren's work. I highly recommend the audiobook as well which is read by the author, although there are a few footnote digressions in the book that don't make it to the audio. *This review also introduces my new rating for books I feel deserve more than 5 stars! These will be for books that are my favorites. In a nice suburban neighborhood, a murderer is loose, killing women who happened to be all alone in their home. Meanwhile, Ellen Gordon is having a hard time with her temperamental daughter, and calls her husband, who is working late, to talk to the girl. After the call, the daughter happens to forget to hang up the phone, so her husband hears when someone comes into the house. Unfortunately the version I listened to had a few scenes missing, so I'm not exactly sure how Ellen Gordon figures out the man who comes to visit is the murderer.... but this is the kind of story that I normally enjoy, with the murderer being an innocuous person and the listener knows he's the murderer so the suspense is in waiting for the main character to find out too. The daughter who never does what's she's told is a bit annoying as a character, but she plays an important part in the story and there's a nice ironic twist in the end so that the daughter is suitably punished for her misbehavior. This was a good episode for as much as I heard, but I'm sure it would be better to hear the full story as it was meant to play out. 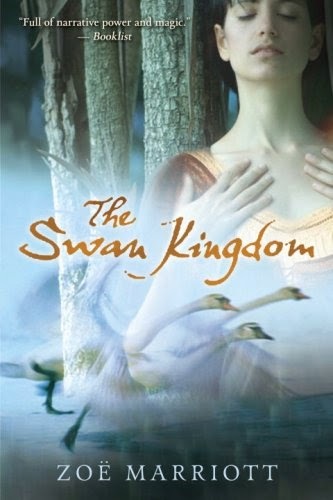 The Swan Kingdom was a lovely story to read - it has a great magical world, and it presents a different spin on the original fairy tale of The Six Swans. I was also impressed that the story brings more detail to the evil stepmother character who is a bit more disturbing as a villain than in the original fairy tale. While the three brothers are sort of cursorily summarized as characters and are not actively in the story for very long, the reader gets to see more of the mother and her influence on the family and the land before she's gone. I admire that this story is full of strong, female characters who all have very different personalities. I found the main character, Alexandra, sympathetic and engaging and perfect to carry the whole story forward. She acted rather more slowly on her brothers' curse than I would have expected, but this story does take on some unexpected turns, especially with how the romance is woven into the tale. I love that the romance is built on the two characters really getting to know each other, instead of falling in love at first sight, so the romance is very sweet and endearing. The main smaller issue I had with this story though was in the rather unresolved story line for Alexandra's Aunt - I was thinking she would play a stronger role in the story, but we don't hear from her again. And also in the nature of the Ancestors who guide Alexandra - I felt a bit confused on their role in the world of this magic. It seemed like they were just there when it was convenient, and were unable to do anything. The reason why this is such an enjoyable read though is in the exciting plot line, the changes that deviated from the original fairy tale (there's a really neat twist about the curse!) and just my own appreciation that it's the women in this story who affect their own lives. So last season of Deep Space Nine, and I was ready for it to end. I am even a little daunted that Voyager also has seven seasons (I hope I'm not burning out on Trek!!) It was hard to pick five favorites for this season, so I picked three that are more standalone episodes as so many of the episodes in this season were linked. The last nine episodes were all part 1,2,3 etc. So that made it harder for me to choose among them since I felt like they were just one big episode. These three I picked were mainly just fun for me, not necessarily the best episodes of the season in terms of story or character. I have many thoughts on this season as a whole though, so this post will not be short! I will just talk about the episodes first and tack on my rant thoughts on the last season and final favorites about the series as a whole in the end. Nog struggles to recover from losing his leg in battle and becomes standoff-ish and remote. He finds solace though in Vic Fontaine's music and decides to stay with Vic in the holosuite. This is a touching episode that shows real character depth for Nog. I've really liked how they developed him from the first season - when he was pretty annoying as the bad influence on Jake, but he's grown so much now. 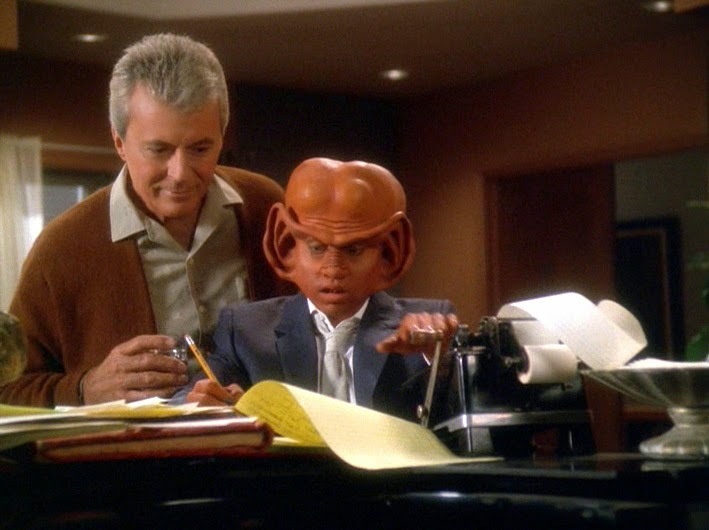 It was terrible to see him in such a depression and have to struggle out of it in this story, and knowing how far Nog has come really drove home the emotion for me. Vic Fontaine is a wonderful character too and I loved seeing a holosuite character make Nog appreciate his life more. This is the last book that wraps up MacKayla's storyline and it is the longest of the series yet. But it has a lot of things to wrap up. After the cliffhanger ending of "Dreamfever", I wasn't expected yet another very shocking revelation in the beginning of this book. Yet after that really awesome reveal, I felt like this book started having some pacing issues. MacKayla got to be a little annoying as well in some of her reactions which was unexpected because I have grown to love her character so much. Of course I don't want to reveal any spoilers, but in some ways I'm sure other readers were happy with the developments. The plot really does take it's time though, as the reader finds out all of the different character's secrets and we learn more about what Mac might be and what happened before she was adopted in Georgia. The world-building is excellent as always, and there are so many different aspects that were revealed that were utterly fascinating. I loved seeing more of the fae world and how different it is to our own. The rules of the fae were interesting, as were the effects of being in that dimension. There's so much going on in this book, that I'm finding it very difficult to discuss certain aspects without revealing any spoilers. So with just focusing on my feelings as I was reading this - I was at times impatient for the story to move forward, for Mac to get a grip on what was happening, and for other characters to step up to their duty. But, there were a few (like four) absolutely jaw-dropping developments that made me want to jump up and down in outrage/shock, and for that I loved this book. It's a mark of a good story for me when it shocks and surprises like this. It's amazing how absolutely unbelievable some revelations are. The denouement of the story was excellent as well - the author did a great job of wrapping up every thread and bringing Mac's story to it's rightful conclusion. I was very happy with the book as a whole, although I'm not sure what to do with myself with a Fever series book that has not ended on a nail-biting cliffhanger! Lt. Langer is a crooked cop who is collecting some blackmail money from a merchant by the name of Bruno. When Lt. Langer leaves he suffers a heart attack. No one is willing to help him though since they assume he is just a drunk in the alley. 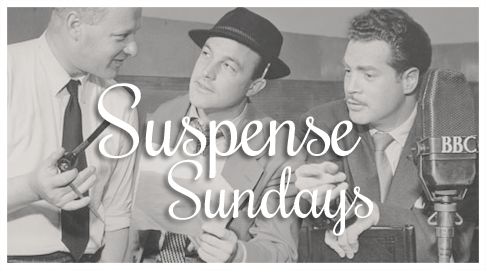 When Bruno realizes it is Lt. Langer in the alley, he has the power to save him. But will he? Penultimate season! Okay, so I have to admit that I looked up something about Worf some time ago and found out what happens to Jadzia - not the particulars but I also knew it would happen this season. So it wasn't as much an emotional impact, but it was surprising how... unremarkably everything happened. I mean Jadzia is a great character, I wish she had gotten something more. Also I wanted to look up something about a particular episode in this top 5 list, and I think I'm spoiled for what happens with Odo in the last season. I tried to slide my eyes away from it the minute I realized what it was saying, but I read enough to feel very disappointed already. There's the possibility that they will make it feel right in the end, but I doubt it. So I'm kinda over the whole romance which was such a big reason why I was loving this series! Ugh. So probably I should really avoid reading about Star Trek anything until I finish all the series. I mean, I was looking up Andrew Robinson, just the actor, and got spoiled for something from his IMDb trivia. (Namely, Ezri's last name.) I say I should avoid it but... I'm not. I like getting the background info sometimes! Also one thing I've been mulling over - I don't really understand why it's so hard for the Dominion to take over the Federation. They seem to have superior technology and soldiers and they have changelings. And it seems like many were in powerful positions and could have done something to really cripple the Federation before they were "discovered." It's kind of hard to believe the Federation is giving them that much trouble. Not to mention all this weirdness with the Prophets. They seem like such a deus ex machina device, and I'm not really liking how Sisko is relying so much on them. From a TV franchise that traditionally celebrated the agency of mankind, it's disappointing to see so much of mankind's failures and weaknesses displayed and now instead of finding a way to triumph, they need the wormhole aliens to help them out. 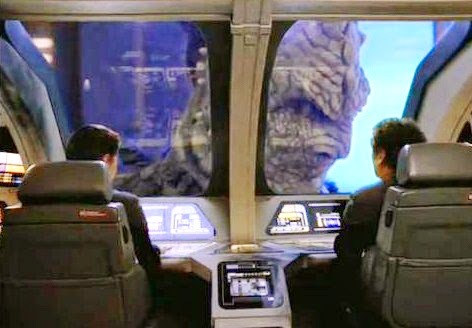 Some of the darker aspects explored in the failings of humankind are realistic and important to explore, but I watch Star Trek to see how mankind overcomes these things and also I prefer to be uplifted more in the TV shows I watch. So just personally I know this series is not the best for me. But anyways, on to my top 5! Dax, O'Brien and Bashir and a runabout are shrunk down in size to complete a particular mission. While they are miniature, the Defiant is taken over by some Jem Hadar, and the little ship makes it's way on the Defiant and does it's best to help Sisko take back the ship. At first I thought I wouldn't particularly like this episode because the whole shrinking thing seemed a bit too silly, but on the whole I really enjoyed how they managed to wrest control from the Jem Hadar and this was a nicely entertaining story. This is a book that was truly written to be savored. The pace in the beginning is leisurely, as the narrator - Sorcha - sets up the nature of life in this version of Ireland, of the enchantment of her village and home and their relationship with the 'fair folk'. Truthfully there were times that I felt the book to be too slow, but that impatience quickly disappeared as I became used to the the author's way of unfolding the story. And Sorcha has a way of dropping foreboding hints of what is to come to keep the reader on their toes. If you are familiar with the original fairy tale of The Six Swans, like I was, it was pretty tense reading this story and waiting for the main elements of the fairy tale to come up. Especially when I knew that things would get so much worse before it could get better. So for me, this was a luxurious fantasy - one that felt very real despite the magic, because we are so focused on Sorcha and have to spend so much time in her head. Her development throughout this book is fantastic - it's lovely to read how she grows into a strong young woman who faces so much adversity, after being so sheltered and loved by her brothers. And the author does a great job of fleshing out different and particular personalities in the six brothers. They all fit together like a jigsaw puzzle, and it's easy to see how they all got along and depended on each other as they were growing up. In Movie Musical Challenge, I'm watching all 25 picks for AFI's Greatest musicals starting from the bottom. 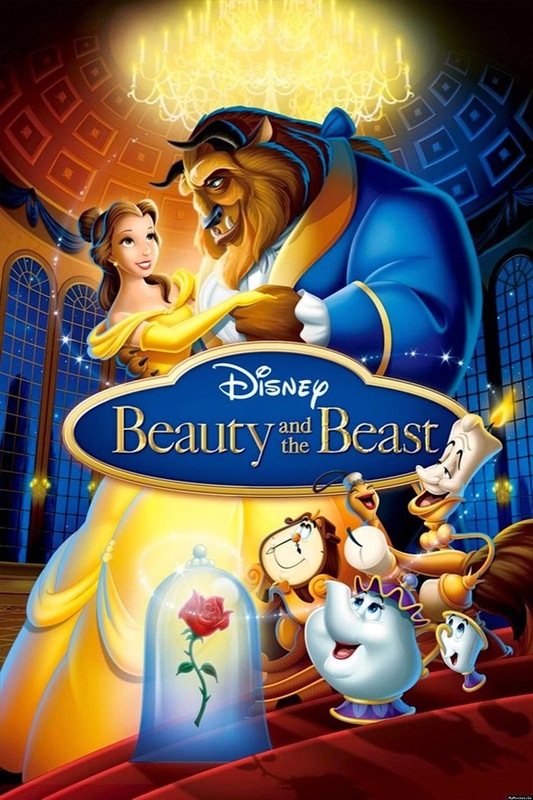 Number 22 is the 1991 Disney film "Beauty and the Beast." The only Disney film on the list! When I first saw that this was the only one, I did puzzle over why this film above all of the Disney oeuvre made the cut. (I kinda think of The Lion King as semi-objectively the best Disney film) I'm still not sure why, but it is one of the best, so I'm not complaining! I was very happy to rewatch this film for the challenge! As Quinn mentioned in her post about this film the prologue, where the narrator sets up what happened to the Prince to make him a Beast is gorgeous to watch -and such an interesting idea to include a prologue in a different style to set up the film. From there, we get an opening song that is very much like a stage musical - because it introduces the main characters and tells a story with a lot of dialogue. And it's very catchy - one of my top favorite songs from the film! And of course much thanks and appreciation goes to my lovely event co-host Ana @ Read Me Away who did so much of the planning for this event and whose google doc updates I always looked forward to reading! And our twitter shenanigans were the highlight! :) (Check out her post for her recap of our chat!) It was wonderful to co-host this with you m'dear! 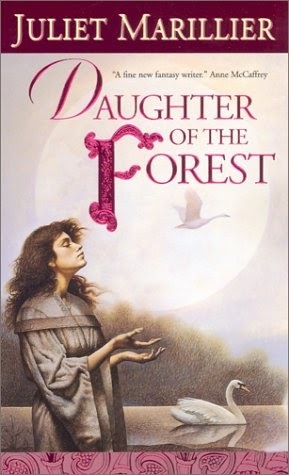 "Daughter of the Forest" by Juliet Marillier (my thoughts on it here), a retelling of The Six Swans fairy tale. "A Court of Thorns and Roses" by Sarah J. Maas. which is a Beauty and the Beast and Tam Lin retelling. It's released in the U.S. on May 5th, 2015, so I will be sending the winner a notification that the book has been preordered for them. My favorite Disney film? Yes. But the fairy tale itself, I have some issues with (namely the ending!!) which means this has to be in the number 5 spot. I still love the poetic beauty of the story though - the mermaid who longs to be a part of something she was not born into (or born with), and of the tragic nature of falling for someone who does not return her love. Her self-sacrifice is very touching as well, which even if I don't know if the Prince deserved it, I appreciate that she didn't want to do something so horrible to save her own life. And in the end, she got something of what she wanted and so a measure of happiness. The Robber Bridegroom is a Grimm fairy tale that is appropriately dark. The heroine finds out that her future husband is a criminal and a murderer and what does she do about it? Traps him and incriminates him at the right moment which results in his death. The justice of it is a pretty great ending to such a dark fairy tale, and I feel like this would make a great dark YA retelling - it has mystery, suspense and danger. And I'm sure a little romance can be worked in. For Thursday's discussion post, I read a fairy tale I've never read before called "The Voice of Death". I think the macabre title attracted me to reading it (I almost went for the Princess one!) but I'm glad I read this as it's really an interesting little story. You can read it here if you are interested, but I'm going to summarize it below. A man is intent on never dying and so goes on a journey to find a place where the people never die. He finds a village and they tell him that no one ever dies, but their population is not overrun because sometimes someone calls for them and that person never returns. The man ridicules these people who leave because they will eventually die, but the man is happy to move to the village himself. So he takes his wife and children with him and they live happily for several years. One night though, his wife hears someone calling for her and she wants to run out. The man tries to keep her inside, but she is desperate to go so he lets her. Many more years pass, and the man is called himself while getting a shave at the barber's. The man yells and threatens the person who is calling him, but no one else in the shop can see this person. The man gets up and runs after the person intending to chase him away, but instead falls to his death just outside of town into a ravine. The next day the ravine is gone and the people realize what's been happening and from then on they die just as everyone does. The ending was a bit of a twist for me, since while reading this story, I expected that the "call" everyone was getting was really death, but I did not know that this particular village was really getting visited by the person of Death to lure them away. It's interesting that because they did not know they were dying, that they did not die in the usual way. Sort of on par with human hubris though - to imagine that we can really change the natural order of things and even alter death by our knowledge. Which is of course what the man in the story does in his attempt to find a way to live forever. That fear of death is integral to the story though - perhaps not knowing what it is makes it easier to bear, as is the idea of death being just a different place that you go to. With the ending, this story strips away any comforting thoughts though, so I'm not really sure what the take home message of the tale is. To face the truth? That's the best that I can come up with! If anyone has any more ideas, I'd welcome more thoughts in the comments! Please add a link to your own Away to Whimsical FairyTale Land post below! I read two retellings of the fairy tale The Six Swans - "Daughter of the Forest" by Juliet Marillier and "Swan Kingdom" by Zoe Marriott. I'll have a proper review of both of these books coming in a week or two, but right now I 'm just going to focus on comparing these books to the original and my thoughts on how well they retold the fairy tale. For reference, here's my post on The Six Swans from yesterday. And if these retellings can do that and capture what I think in "The Six Swans," are the important themes (a strong family connection, the strength of women, and the pain women have to endure) then I feel these were very successful books as retellings. Day 2 for Away to Whimsical FairyTale Land is a post exploring the fairy tale I chose! 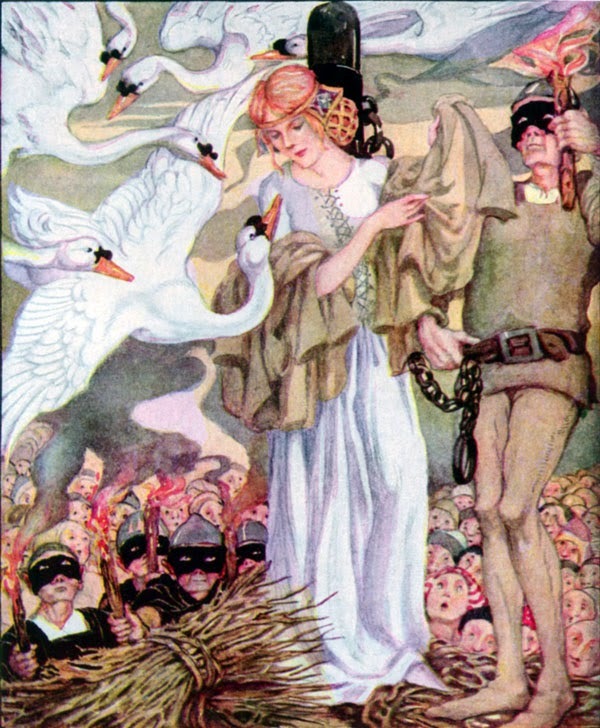 In The Six Swans a jealous stepmother curses the children of her husband, the King, and turns them into swans. Only the daughter is left, and when she finds out that the only way to break the curse is to make six shirts for her brothers, while keeping silent for six years, she undertakes the task. Meanwhile, another King or Prince happens upon her, falls in love, and marries her, although she never says a word. She gives birth to three children, and each time her jealous mother-in-law takes the child and makes it appear that the child was eaten or killed by their mother. When this happens the third time, the King has to order his wife's execution, but the six years are up and at the stake, the sister throws the shirts on the swans and is finally able to speak. The biggest theme of this story is family love and fidelity, with the sister going through a lot to save her brothers. She won't even speak up about her children, in her dedication to break the curse. Such a chilling aspect to this story - it's worse than the curse placed on her brothers, that the mother-in-law would possibly try to kill the children (I think in some versions, she orders their death but it's not done) and then blame their mother for the deaths, just because she's not happy that she married her son! Two examples of awful, manipulative and jealous women are juxtaposed by a paragon of virtue in the sister in this story. It's interesting that the women play the active roles in this tale - the brothers and the Kings are just sort of in the background as the sister works to save them. Another aspect that I thought was interesting to this story (that is explored in a note on the SurLaLune website) is the role of silence. Swans were thought to be silent and said to only sing when they were close to death, and the idea that a woman must be silent and endure is probably a virtue that was well thought of when this story was circulated. It is an anti-feminist way of looking at it, but it can also be seen as a way to show just how strong a character the sister is - that in addition to the hardships she goes through, she also maintains her silence and can not have the comfort of sharing her troubles for all that time. She is utterly alone. I was familiar with this story before, but reading and thinking about the text for this event, made me appreciate it more. It has so much more of an impact for me now, and I'm looking forward to picking up on some of those themes and ideas I've mentioned here in the retellings I'm reading! It's the first day of the week long fairy tale event I'm co-hosting with the lovely Ana @ Read Me Away! If you want more information about the event - check out my post here. If you haven't signed up but would like to participate a little, I hope you can join us for our #AWFairyTale twitter chat this Saturday, March 7th at 6pm PST/9pm EST. It will be for an hour and we'll have questions and trivia to answer! What is the fairy tale you picked? Why did you pick your fairy tale of choice? I picked this one because I've been wanting to read 'Daughter of the Forest' by Juliet Marillier for a long time now, and this gives me the perfect incentive to finally pick it up! I'm also planning to read 'The Swan Kingdom' by Zoe Marriott because I've really enjoyed a Marriott fairy tale retelling in the past, and this one sounds excellent! Dr. Fraser calls the police when he receives a threatening letter accusing him of murdering a patient and getting away with it. Lieutenant Nieman is dismissive of the crank letter, but Dr. Fraser receives another, and then receives another - not through the mail, but left on his desk. Lieutenant Nieman is seriously investigating now. While this is a solidly constructed suspenseful story, I feel like I've seen the twist in this done too much to be really impressed by it. It was probably a great episode to listen to at the time though, so overall I think this is an enjoyable episode. There are some good misdirection scenes to keep you from guessing the outcome.